Sports betting in America is a billion dollar business. $3.2 billion was wagered in sports in Nevada in 2011 alone, primarily on American betting lines. Football betting accounted for $1.34 billion in that state, according to the Nevada Gaming Commission. $100 million is gambled annually at the Super Bowl in Nevada casinos. And around the world, estimates show as much as $8 billion is wagered each year on the NFL championship game. $70 billion a year is wagered on NCAA football games. USA residents betting on sports account for the majority of the $30 to $40 billion bet on Major League Baseball. And most estimates show that nearly $3 billion worth of bets are placed on the three week March Madness NCAA men's basketball tournament every year. One in 10 Americans fill out March Madness brackets each year, and as many as 40 million USA residents spend money on fantasy football leagues. So if USA based companies are not allowed to offer sports betting options to US residents, where is all that money going? Smart US sports bettors hold accounts with established offshore (meaning not located in the United States) Internet sports betting sites. This is not the early 1990s anymore. The Wild West atmosphere of the Internet has changed. There are legitimate companies backed by large corporations with deep pockets licensed by respected Internet gambling regulatory bodies. They are licensed to offer sports betting to US citizens, and in some cases, international gamblers as well. They treat every customer as a VIP, because they understand that United States residents love placing wagers on NFL, NHL, MLB, NBA and NCAA college sports. And legal aged adults who work very hard for their income believe they should be able to enjoy sports betting in America for real money if they choose to. The top rated offshore USA sportsbooks agree. And you know what else? The WTO also agrees that the United States cannot dictate or regulate the actions of businesses not owned or located in the USA. That is why PASPA, the UIGEA and the 1961 Federal Wire Act do not apply to a handful of legally licensed and reputable offshore sportsbooks. Those are the "Big 3" of American sports betting laws. We have a section of our site dedicated to explaining them, and how they have helped create a viable, safe and secure offshore sports betting industry that caters to USA players. It also bears mentioning that not one single law exists at the federal level in the United States, which outlaws a USA citizen from placing a sports wager. For all the above reasons, it is so important to ensure that you only placing bets at a US-friendly sports betting site that is legally licensed. Don't worry, we will show you the top ranked sites which cater to US sports bettors and also carry legitimate licensing. Between our online gambling industry analysts and ourselves, we have decades of sports betting experience. Because of this, we have included a section of our site that outlines American sports betting tips. This is created for US residents by US residents. All of the sports betting strategies we recommend take into account odds, tendencies, trends and sports betting line makers. We will provide you with proven money management and sports betting tips and tactics which we use ourselves and that professional USA sports gamblers consistently exploit to improve their expectation of winning. Whether you prefer the excitement that is NCAA college football, you have learned to consistently profit from Major League Baseball action, or you are one of the millions of Americans that love betting National Football League action, our sports betting tips for USA residents will help make you a smarter and more profitable gambler. Finally, we review the most popular US online sportsbooks. We will show you which legally licensed US-friendly Internet sportsbook is known as the site "where the line originates" so you can get the earliest possible numbers every week. We also point out in our reviews not only which welcome bonuses are the biggest, but also those which have the smallest rollover requirement. This puts that free money in your pocket quicker. 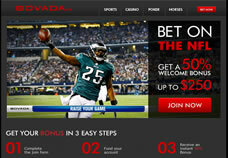 Sports betting Americans also want to know where the "better than Vegas" sports betting lines and odds are located. We have uncovered that information as well. Sports betting in the USA these days means mobile support. We uncover in our Sportsbook Reviews section where you will receive the best mobile sports betting action, while also benefiting from a safe and secure, legally licensed bookmaker. Add us to your favorites or bookmark this page and check back frequently for sports betting information and resources which are important to you, the United States sports bettor.